APPEARANCE: Child-like and mischievous, hitotsume kozō are little one-eyed goblins who are well-known in all parts of Japan. They have a single, enormous eye, a long red tongue, and wear shaved heads and robes, like tiny Buddhist monks. BEHAVIOR: Hitotsume kozō are relatively harmless as far as yokai go; their most alarming trait is appearing suddenly and surprising people on dark streets, which they seem to enjoy doing. Hundreds of encounters have been reported over the years, most of them very similar to each other, and they simply detail a mischievous spirit who likes to spook people late at night. INTERACTIONS: In East Japan, it is said that every year on the 8th of December, hitotsume kozō travel the land, recording in ledgers the families who have been bad that year in order to decide each familys fortunes for the next year. They take their reports to the god of pestilence and bad luck, who brings misfortune on those bad families in the coming year. However, they leave their ledgers with the guardian deity of travels for safekeeping until February 8th. In a mid-January ceremony, local villagers burn down and rebuild that deity’s roadside way-shrines in hopes that the fires will also burn the hitotsume kozō’s ledgers before they come to pick them up (thus escaping disaster that year). 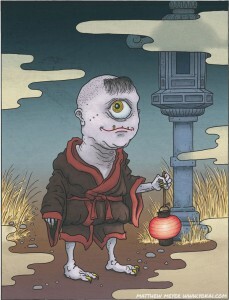 ORIGIN: Though similar in name to other one-eyed monsters like hitotsu-me-nyūdō, there is little evidence suggesting a relation between the two. Many believe that hitotsume kozō’s origins are connected in some way with Enryaku-ji, the head temple of the Tendai sect of Buddhism. Others believe that they were once local mountain deities who over time became corrupted and changed into yokai. LEGENDS: A man named visited a friend on business. While waiting in the reception room, a young boy of about 10 appeared and began to mischievously roll and unroll the hanging scroll in the rooms alcove. When the man scolded the boy for being mischievous, the boy turned around and squawked, “Be quiet!” However, the boys face had only one eye! The man screamed and fainted, and had to be carried back to his own home. He was bed-ridden for 20 days, but made a full recovery. In an account from Fukushima, a young lady was walking the street at night. A little boy approached her from behind and asked, “Maam, would you like some money?” She laughed and sweetly replied yes, and turned to face the boy. He was a hitotsume kozō, and he was grinning staring so intensely at her with his single eye that she fainted in shock on the spot. A similar tale from Okayama tells of a particular street where an eerie, pale blue glow was seen one night. A man went to investigate and witnessed a ghostly one-eyed boy playing around. The man collapsed, paralyzed with fear, and was unable to move. The apparition approached the helpless man and licked him from head to toe with his long, slobbery tongue.